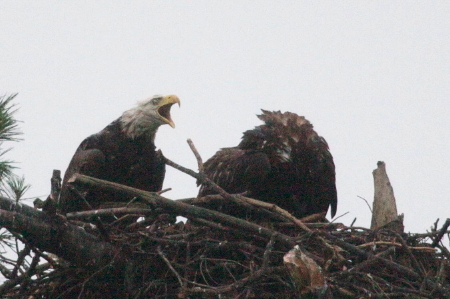 I visited the nest today around 3:30 PM and when I arrived I heard voices below the nest. I walked over towards the nest and Pat Huckery from the State Wildlife was there holding one of the eaglets. The eaglet was spotted of the ground on the about 250 feet to the north side of the nest by Frank Esielionis earlier in the day. The eaglet was not real responsive and Frank contacted the State to report the eaglet's condition. When Pat arrived the eaglet had made it's way back to the base of the tree, but was still not real responsive. 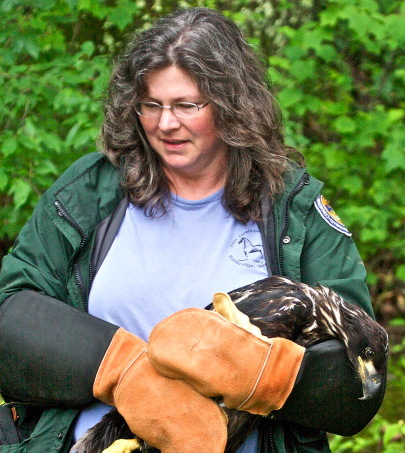 Pat has transported the eaglet to Tuffs Veterinary Hospital in Grafton, MA with hopes it will be returned soon to the nest.